Zynga CEO Mark Pincus dumped $200 million worth of stock this past April, three months before his company's stock suddenly tanked last night, according to a new report. According to Yahoo News, Pincus sold $200 million worth of stock back in April, just when the year's second financial quarter had begun. Other investors and executives, including Zynga's CFO, COO, and General Counsel also sold millions worth of stock. Yahoo says they sold a combined 43 million shares of stock at $12 a share for a total of $516 million. 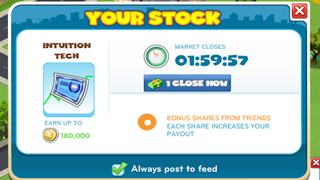 Zynga's stock is currently trading for $3.17 a share. According to Forbes, Pincus still owns about 67.7 million shares in the company. Zynga, best known as the company behind games like Words with Friends and FarmVille, blamed yesterday's sudden stock drop on new Facebook notifications that downplay old games as well as the failure of Draw Something, which the company purchased earlier this year for $210 million. Zynga stock dropped 41% after the market closed last night. I've reached out to Zynga for comment and will update should they respond. Update: Multiple law firms are investigating Zynga for possible stock shenanigans.